HTC has brought consumers numerous hot smartphones, like the hottest HTC Evo 4G at the moment, the HTC Hero, the HTC Touch, the HTC Desire and so on. What is your way to watch videos, TV shows, podcast, and movies on these remarkable HTC phones? In case you haven’t found out a proper way to watch videos in different formats on your HTC smartphones, this guide provides you with a solution on how to convert video to HTC phones for entertainment with Pavtube video to HTC converter. Go to check a detailed tutorial in the following contents. The video to HTC phones converter we will use supports input a wide variety of videos, including TiVo recordings from TiVo DVRs, MOD, TOD, MTS/M2TS, MXF footages captured by JVC, Panasonic, Cannon, Sony, DVs/cameras/camcorders, FLV/F4V files downloaded from video sharing websites like YouTube, Metacafe, Hulu…, the popular MKV files, Xvid/Divx encoded AVI files, WMV/MOV/TS/TP files, M2TS and VOB files from copy protection removed Blu-ray discs and standard DVDs, more than that, copy protected commercial Blu-rays and DVDs are supported as well. Tutorial: How to convert video to HTC Evo 4G, HTC Hero and HTC Touch with video to HTC converter? Step 1: Free download video to HTC converter, install and launch it. Once launch it, click “Add Video” to load your source videos. The video to HTC phones converter supports batch conversion, so you are allowed to add multiple video files into it at a time. Also, if you wanna join all the files into a single file, you can tick off “Merge into one file” to realize this goal. Click on the pull down menu of “Format” and then hit “Android” option, afterwards, all the presets developed for HTC phones will show up as below, like HTC Evo 4G, HTC Hero, HTC Touch, etc. To convert video to HTC Evo 4G, you can select “HTC Supersonic Evo 4G MPEG-4 Video (*.mp4)”, to convert video to HTC Touch, you can choose HTC Touch Pro MPEG-4 Video (*.mp4)”, to convert video to HTC Hero, you can select “HTC Hero (T-Mobile G2 Touch) MPEG-4 Video”, etc. Overall, which format to choose is totally depending on the model or type of your HTC phone. 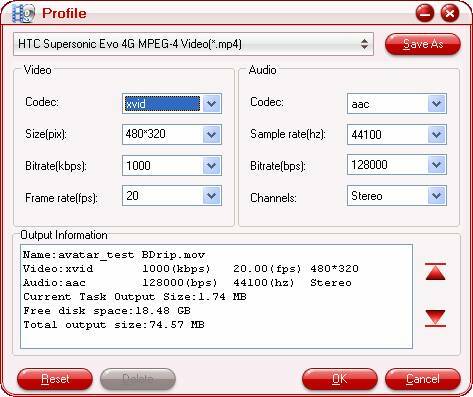 We choose “HTC Supersonic Evo 4G MPEG-4 Video (*.mp4)” as output format for example. No matter you need convert video to HTC Evo 4G, or convert video to HTC Touch/Hero/Desire or whatever, you are allowed to adjust video and audio settings to customize the output file quality. The adjustable settings include codec name, aspect ratio, bit rate, frame rate, sample rate and audio channel. 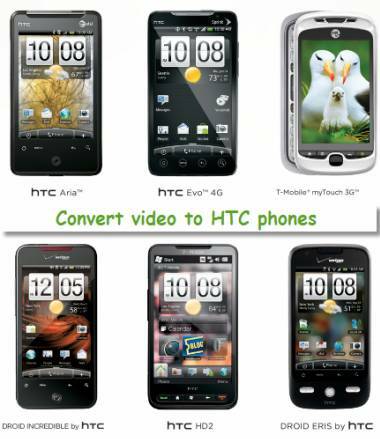 Click “Convert” button to start converting video to HTC Evo 4G/HTC Hero/HTC Touch…by using video to HTC converter. With multi-thread encoding technology and optimized audio and video in sync technology, Pavtube video to HTC phones converter is able to finish conversion at speed without any audio and video out of sync issues. In addition, it adopts unique built-in codec, which will absolutely ensure not to install any codec on your computers to disturb the original systems. 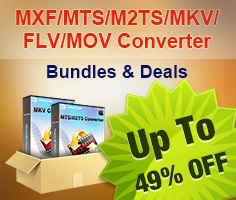 For its powerful conversion ability, as well as the perfect output quality, fast conversion speed, and clean and green conversion environment, Pavtube video to HTC converter is a practical utility for you to convert video to HTC hero, convert video to HTC touch, or convert video to HTC Evo 4G for entertainment. Once the conversion is finished, you can click “Open” button to get the final output files for your HTC phones. 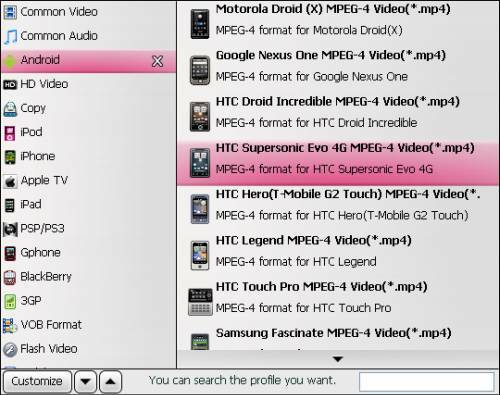 If you are using a Mac computer, you can learn How to rip Blu-rays, DVDs, and convert videos to HTC Evo 4G on Mac. Check the Android Special for more solutions about Motorola Droid (x), Droid 2, HTC Incredible, HTC Evo 4G, Samsung Galaxy S, Blackberry Torch,etc.